Nothing special on this post, i just copy paste the official rules of GBWC PH just to remind all the participants that GBWC is already on November 18-19-20. Good luck on your Entries! I hope you can finish them in time! The art-work on the Banner is made by longai-d3cdlmk from Deviant-art, and I just put the PH Flag and GBWC Logo. Note: we have directly copy-pasted the text, so there will be as little distortion as possible from the original text. v Medal, Gundam showcase worth P 15,000 and will be the official representative of the country in 2011 GUNPLA BUILDERS WORLD CUP Finals on December 2011 in Hong Kong, with free 1 round trip ticket and 4 days and 3 nights accommodation. v Medal, Gundam showcase worth P 6,000 and will be the official representative of the country in 2011 GUNPLA BUILDERS WORLD CUP Finals on December 2011 in Hong Kong, with free 2 round trip ticket and 4 days and 3 nights accommodation. All participants will receive a certificate for joining this contest. The contest has four (4) major categories: Interested participants can paint, remodel, modify, or create a diorama using official Bandai Gundam model kits including SD/BB. All participants may submit their entry either in DIORAMA or SOLID MODEL KIT form. Maximum size of entry is L50cm X W50cm X D50cm. - Open category – 15 yrs old and above, born on or before December 31, 1996. - Junior category – 14 yrs old and below, born on or after January 1, 1997. Gundam enthusiasts who are amateur modelers or have already joined the previous Gundam model kit contest. - New Challenger Junior category – 14 yrs old and below, born on or after January 1, 1997. Gundam enthusiasts who never joined any of the previous Gundam Model Kit Contests. OUT OF THE BOX build (applying modeling basics), but use of Bandai Decals & any color schemes and patterns are allowed. No Diorama Entries for this category. Maximum of three (3) entries per participant is allowed. All participants are required to confirm their participation by email (marketing@bankee.com.ph) from October 15 to November 15, 2011, please send us the following information: NAME, AGE, ADDRESS, CONTACT NUMBER, CATEGORY and NUMBER OF ENTRIES TO BE SUBMITTED. Entry number will be given and sent via email after the confirmation has been made. All entries that are going to be submitted on the contest must have entry numbers; only entries with entry numbers will be accepted during the submission of actual entries. Participants should submit their ACTUAL ENTRY for exhibit on November 18 (11am to 8pm) and November 19, 2011 until 12nn at The Atrium of Robinsons Place Ermita Manila. Participants are required to present original Gundam kit boxes for authentication purposes. Special category participants must bring also the original instruction manual. All entries must not have been used or submitted in any local or international competition. Upon submission of entry, applicants are required to sign a certification form that the entry was made by the applicant himself/herself. Participants shall be provided a copy of entry form to be presented during the judging and claiming of entries. Winners will be determined by a panel of judges; judging will start at 2pm on November 19, 2011 at The Atrium of Robinsons Place Ermita Manila, in the presence of a DTI Representative. Announcement of winners and awarding ceremony will be held on Sunday, November 20, 2011 at 4:30PM. All participants are encouraged to attend the judging and awarding ceremony, in which all entries can be claimed after the ceremony. In claiming the winning or non-winning entries and/or prizes, participants should present a valid ID and a copy of entry form. In a case where the owner/maker of the entry is not available to claim his/her entries and/or prizes, an authorization letter, copy of entry form and a valid ID should be presented before the organizer shall release the entries and/or prizes and being claimed. If entries and/or prizes are not claimed after the announcement of winners, participants will be notified through registered mail. Unclaimed entries and/or prizes can be claimed at the Marketing Department of Bankee Trading Inc. Head Office #6 Rest Haven St. SFDM Quezon City; a valid ID and a copy of the entry form is a must to claim the entries and/ or prizes. Grand prize winners from Open and Junior category must bring their actual entry and should secure travel documents. Terminal fee and other related expenses shall be shouldered by the winners. 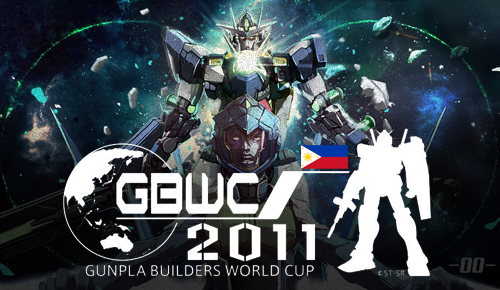 The trip is valid only during the 2011 GUNPLA BUILDERS WORLD CUP FINALS competition in December. Organizer will shoulder 1 round trip ticket and 4 days and 3 nights accommodation for Open Category winner and 2 round trip ticket and 4 days and 3 nights accommodation for Junior category winner.